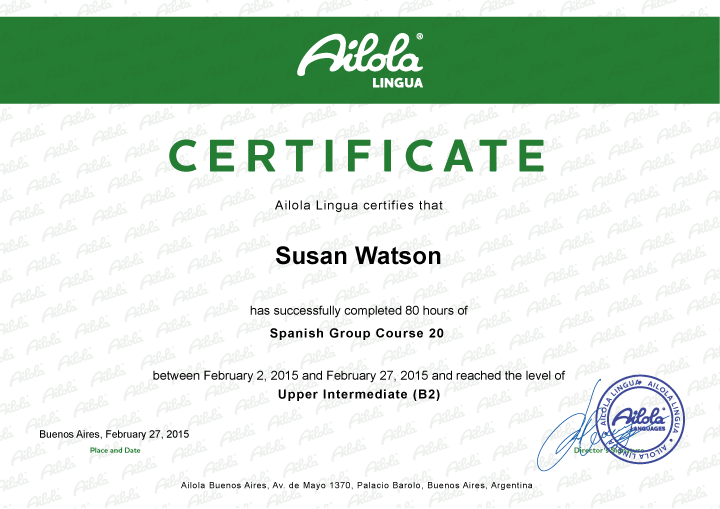 Upon completion of your language course, you will get a personal Ailola Certificate. Show off your language knowledge to advance in your professional or academic career or decorate your room to remember the good times! The Ailola Certificate is our way of recognizing the achievements and dedication of students who come from far and wide to learn Spanish at one of the best language schools in Argentina. By completing at least 80% of your lessons, reaching your course's full duration, and achieving the milestones of the language level you're aiming for, Ailola Buenos Aires will reward you with our prestigious Ailola Certificate. Haven't you received your Ailola certificate yet? Please contact us at [email protected].